Barney's, online at barneys.com, is the destination for luxury handbags, accessories, clothing, and more. Barney's offers huge deals on jewelry, coats, denim, dresses, sweaters, lingerie, shoes, bags, swimwear, cosmetics, home decor, and more. Barney's also carries designers such as Fendi, Valentino, Saint Laurent, Aesop, NARS, Ginger Brown, Tiny Cotton, and more. Stop by RetailSteal.com for the latest Barney's coupon codes and discount codes. Barney's offers shipping promos that change often. Visit RetailSteal.com for the latest Barney's shipping specials. Enjoy free shipping on all orders at Barney's. Enjoy a free $25 gift card with every $250 spent at Barney's. Save up to 75% on sale items at Barney's. Save up to 70% on handbags at Barney's. 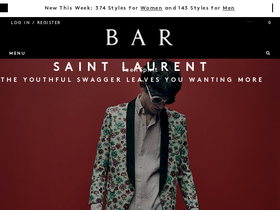 Enjoy exclusive promos with email sign up at Barney's.